The effect of light is all important in David’s work and in this film he once again paints in oils, choosing a variety of different subjects to illustrate his way of painting. 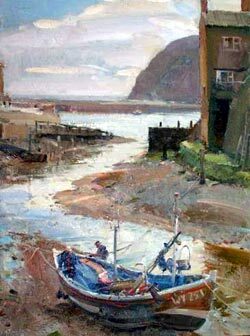 He captures sparkling water, shining roofs and reflections, painting views of the harbour, streets and boats of Staithes. 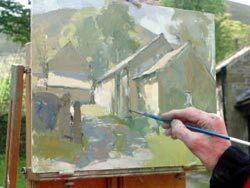 He then travels to the Peak District, painting two different views of farm buildings nestling against the rolling hills in the afternoon light. 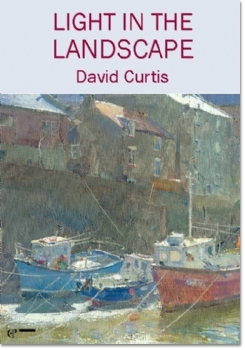 David Curtis is a fine painter in both oil and watercolour and is a member of the Royal Institute of Oil Painters and of the Royal Society of Marine Artists. In his video Light in the Landscape he paints on location three scenes in the attractive harbourside town of Staithes and two in the Peak District of Derbyshire. He works quickly and intuitively and has the ability to capture the effects of light on the landscape. He instinctively recognizes a promising subject and has the talent to capture it in such a manner that it forms an interesting and pleasing pattern as well as a bold pictorial impression. His first two subjects are painted contre jour, or looking into the sun, and here he makes the most of the light catching the tops of foreground boats against a background in shadow. He is not concerned with precision or detail and instead concentrates on capturing mood and atmosphere. His third Staithes' subject is a lane leading down to the sea and here again his bold, direct approach results in an excellent impression with an attractive underlying design. His Peak District subjects are both stone farm buildings nestling against rolling hills. The month is May and the fields and trees are at their freshest and greenest. He makes the most of the available tonal contrasts and quickly captures the essence of his subjects in the warm afternoon light He' chats informally as he paints and so helps the viewer to see the problems and solutions through his eyes. This is an excellent video which will appeal to all and particularly to landscape painters in oils. In Light in the Landscape we join David Curtis on a late-winter painting trip to one of his favourite locations, Staithes in Yorkshire, and later in the film we watch in admiration again when he paints the early summer greens, farm buildings and distant rolling hills of the Peak District. Wherever he goes, whether the subject is sparkling water, boats, street scenes or rustling trees, the pace is furious as he tests his skills against the problems of contre jour, changing light, incoming tides and other equally difficult aspects of painting. David's method is essentially alla prima, what he describes as "the one-shot attempt". Working at a box easel and using a fairly limited palette, his concern is for light, mood and a sense of place. Each painting is a masterclass in how to achieve these qualities when faced with the various difficulties, distractions and constraints that are synonymous with location work. The painting, the advice, the filming - nothing could be better!